You certainly know that KIC InnoEnergy S.E. has offices covering 8 European countries, from Portugal to Poland, Spain to Sweden. But do you know that our geographical scope to support sustainable energy in Europe goes further than the countries in which we are based? The Business Creation officers of KIC InnoEnergy France recently detected and selected the Sardinia-based Italian start-up Gramma, which offers integrated agro-energetic solutions that help farmers worldwide to increase their productivity whilst respecting and improving the environment. Welcome to M. Jacopo Rubbia and his team within our community! You will find below a translation of an article that was published on assoRinnovabili.it (Association of producers, industry and services for renewable energy). 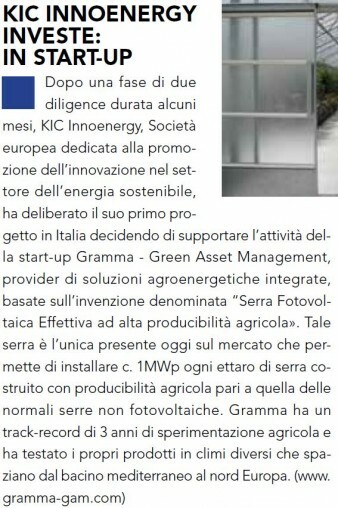 After a period of due diligence which lasted a few months, KIC InnoEnergy, Società Europea dedicated to promoting innovation in Sustainable Energy, approved its first project in Italy and decided to support the activities of the start-up Gramma - Green Asset Management, integrated agro-energy solutions provider, based on the invention entitled “Effective Photovoltaic Greenhouse with high farming productivity“. This innovative greenhouse is the only one on the market today that allows installing c. 1 MWp per hectare of greenhouse built with agricultural producibility equal to that of normal non-solar greenhouses. Gramma has a track record of three years of agricultural experimentation and has tested its products in different climates ranging from the Mediterranean to northern Europe. Gramma is a company that develops and markets agroenergetic solutions, basLogo Grammaed on the patented Effective PV Greenhouse, for a spectrum of clients ranging from pure renewable energy investors searching for higher financial returns to advanced agricultural producers looking to increase the profitability of their overall businesses.